Entanglements. C'est Bon Anthology gets entangled in story and image alike. Through the years C’est Bon Anthology have presented text pieces that shed light on the art form from unexpected angles. From now on we are focusing our gaze in order to give a deeper insight into the world of comics. In “CBQ&A” we will be turning our attention to the creative process of imagemakers and storytellers that are featured within the covers of this anthology. The first artistic voice to be heard is Allan Haverholm; co-editor for the anthology, as well as a brilliant and prominent comics artist. Authors: Allan Haverholm [DK], Chad Verrill [US], Ed Homer [US], Eliza Frye [US], Jacob Rask [DK], Martin Flink [DK], Michel Ducourneau [SE] ISBN: 978-91-978089-3-4. Entanglements. C’est Bon Anthology gets entangled in story and image alike. Eliza Frye shows what might take place on other levels for a father and a daughter during something as ordinary as a dinner at a Chinese restaurant. New segments! We present the first piece in the series “Comics as Art – Art as Comics”. 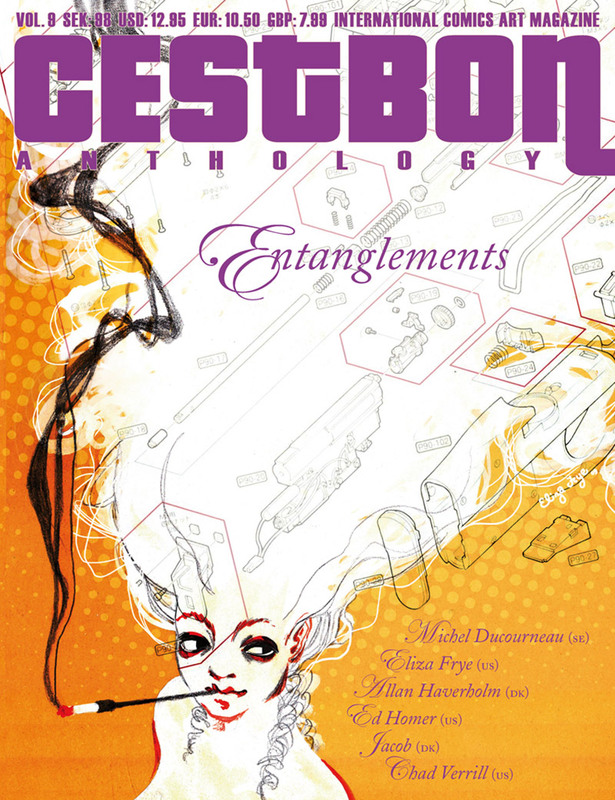 We invited visual artist Michel Ducourneau to create a piece especially for this issue of C’est Bon Anthology. For every new issue we will invite an artist who does not usually work with comics, to create one full color page as a bridge between comics and other forms of expression within the visual arts.